Read this BBC article and come back to me. No really, go on, I'll wait. You might not think it, but this article and story reflects so much of what is wrong with our society, our media, our politics and our world today. I am just listing the things that come to mind as I read it. 2. 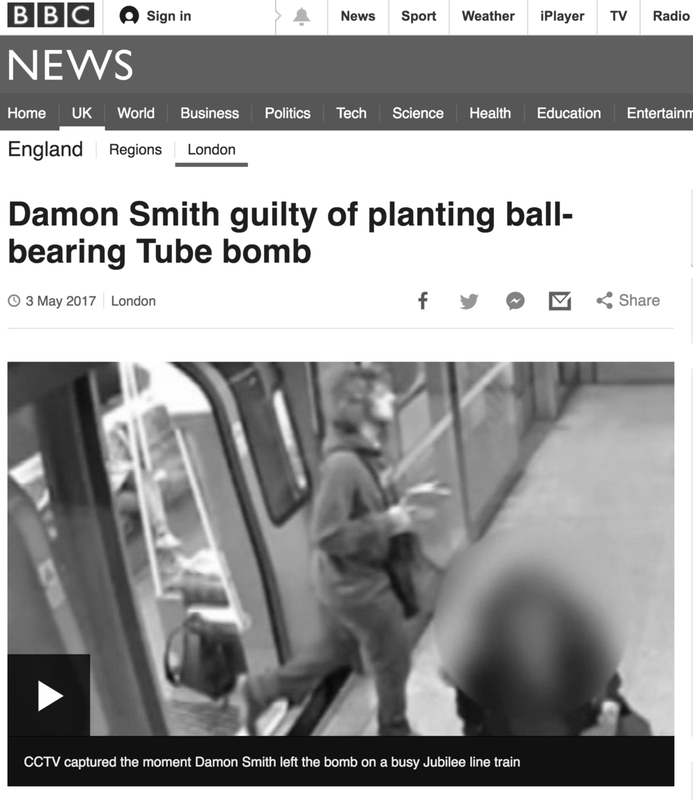 Paragraph reads; "The Old Bailey was told Smith had an autistic spectrum disorder and a keen interest in guns, bombs and other weapons, which may have been a function of the condition." Again, giving a reason/excuse for why this man is an anomaly to his group. Non-muslims get this treatment by the police, the press and politicians. Muslims do not. But beyond that, I have to say, that, in most cases of so-called "terrorism" and in cases such as this, the perpetuator has a mental, psychological or developmental condition. These services at local council and NHS level have been severely cut. We seem to constantly want to either find a connection with Islam, or make an anomaly that is swept under the rug out of these cases. We don't want to make the connection to mental health and austerity cuts. Personally, I don't believe people with mental, psychological or developmental conditions should be in jail. 3. Paragraph says "His lawyer told the trial he was no "hate-filled jihadi" and never meant to harm anyone." Read; if he was a Muslim, with the exact same circumstances or conditions, he would be a hate-filled jihadi. but since he is not, his actions never meant to hurt anyone. Also read; threshold for muslims and minorities to be terrorists much lower. 4. "The Met said he was not charged under the Terrorism Act because there was not enough evidence that his crime was politically motivated." Then it says "Former altar boy Smith built the device with a £2 clock from Tesco after Googling an al-Qaeda article on how to make a bomb." Language is so important for the press to get their message across. It's mostly about what stereotypes certain terms "contain". If this guy was a Muslim, googling an al-Qaeda article would that be enough for it to be terrorism? Yet here, we have to create an anomaly. So he is a former "altar boy" - it was a "halloween prank" - and then they tell us about Al Qaeda. 5. "Jurors were told he had professed an interest in Islam as he felt it was "more true" than Christianity." So basically, he's anomaly because of his Christian bit, and anything he's done wrong is because of his Islam bit. 6. His lawyer, Richard Carey-Hughes QC, said there was "no evidence that he changed from clinging to his mother's apron strings to a soldier of Islam and a would-be soldier". Such emotive language. Again little Muslim "soldiers" (not even terrorists, actually just anyone Muslim, who may one day, want to fight for their religion in any way shape or form) never clung on to their mother's apron strings. When Muslim "terrorists" are actually just criminals, or mentally unstable, or just a lone wolf nutter with a bread-knife, it is terrorism straight away. When it is a non-Muslim, then he just a vulnerable little boy clinging on to his mummy's apron in the kitchen, and even if he has done anything wrong, it is that evil Islam that may have influenced him. I really recommend that every so often, you guys do this too. Take a step back and look at a simple article and highlight all these markers to remind yourself, and others, how very, very twisted and dark our "status quo" has become.